Ruby Fortune considers itself to be a gem of the online casino industry, so let’s investigate to see whether this jewel is flawed or not. Operating since 2003, the site has certainly been around long enough to demonstrate that it must be doing something right. This casino has a four-part mission statements, which it calls its 4 ‘Ruby Rules’. These are that their payouts are generous, deposits and withdrawals are simple, personal details are securely maintained and that gaming on the site is all about fun. There are certainly plenty of games to choose from on this ruby red-hued site. Apart from the predictable colour scheme, the design is a little drab and conventional. Certainly this site has not followed the humorous approach favoured by many modern rivals. However, there is still a lot to offer players at this distinguished casino site, so let us investigate a little further. WHAT IS Ruby Fortune Casino? When Ruby Fortune launched in 2003 it was named New Casino of the Year and has maintained a strong reputation since then. This casino is part of the powerhouse Palace Group, which also includes Spin Palace, Mummy’s Gold and Cabaret Club among its members. The casino boasts over 450 games, including video slots, table games, instant win games, progressive jackpots and live dealer games. The site is secure with a great customer support team behind them. 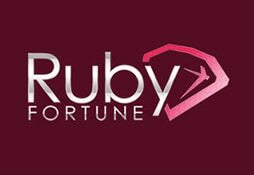 The welcome bonus at Ruby Fortune goes up to $/€750, as long as you make the required deposits within the first 7 days of signing up. The bonus breaks down as follows: First deposit is matched by 100% to a max of $/€150. The next one is 50% and goes up to a maximum of $/€200. Then if you make a third deposit within 7 days you get a 25% matched deposit up to $/€400. Given that the playthrough required to release the bonus is a quite demanding 50 times your bonus amount, this deal is not as good as others around. For example, to max out your deposit bonus you would need to deposit $/€2,150 within a 7 day period which is pretty steep for most people. Ruby Fortune offer a great selection of payment methods, meaning that all players should be able to deposit and withdraw without any concerns. If debit or credit cards are your favourite, choose from Mastercard or Visa. Electronic wallets like Paypal (for the UK), EcoCard, Skrill and Neteller are also offered. Plus you’ve got virtual Entropy cards as well as the Paysafecard voucher system. Then for traditionalists there are various bank transfer options such as DBT, Citadel, and e-Checks. Whether you like the selection of games available at Ruby Fortune Casino will largely depend on your feelings about Microgaming, who power the site. That means you get slot games like Jurassic World, Castle Builder, Mega Moolah, Emperor of the Sea and Forbidden Throne. There is also a nice live dealer selection, alongside the RNG table games. If you like video poker then you certainly have plenty of options to choose from here, with just about every variation imaginable. Ruby Fortune Casino prides itself on fair payouts, and the overall payout percentage from this casino is a more than respectable 97.49%. The games on the site are certified by eCOGRA, which means they are subject to regular checks to ensure that they are paying out correctly. With a focus on customer service, it is no surprise to discover that you can get in touch with the casino any time of day or night, 365 days a year. The professional and courteous staff will be standing by to assist with any questions. You can contact them via live chat, or email. If you want to speak to someone by phone, then there are three toll-free numbers to choose from depending on where you live. The greatest sign that this is a secure and customer friendly site can be gauged by the fact that it has been operating for about 15 years. There is no better recommendation than that in this industry. To sum up the approach of Ruby Fortune Casino based on its four main principles, it aims to be Fair, Easy, Safe and Fun. Now it must be said that the aesthetics of the site are not great. The fun and zany approach taken by a lot of modern casinos is not present here. Instead its a fairly dull and safe design. The gaming selection is good, although you must be a fan of Microgaming to appreciate it as there is no range of different providers. When it comes to player security and customer support you are on very safe ground with Ruby Fortune Casino. So yes, this casino is a jewel of a site, but perhaps not the most sparkling gem in the shop.